This page explains overlapping map features within one map layer. Also see Overlapping Layers in MapGuide for overlapping layers that are on top of each other. Some Improvement Plan areas in this sample map overlap. You can guess which ones, but do you know for sure? There is no way to know and identify the mapped plan areas without selecting the area of interest and getting a report. You'll be surprised to see what overlaps -- and what doesn't. 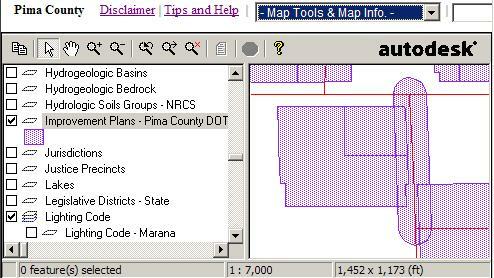 Pick MapGuide's default Select tool on your MapGuide map toolbar.